SC2SEA.com - Starcraft 2 SEA eSports Community Site > Site Portal Forums > Latest News > [ACL] ACL Sydney: Get to know Blysk! [ACL] ACL Sydney: Get to know Blysk! First of all, tell me how did you start playing StarCraft? Were you a BroodWar fan? Thomas 'BlysK' Kopankiewicz: No I wasn't. I started playing WarCraft 3 Reign of chaos with my brother and dad whenever I went back to Germany to visit them in the winter as a child. So my interest for gaming must have developed from then. StarCraft was introduced to me by a close friend named Chris when SC2 just came out. He bragged to me about how the graphics were awesome and there were tanks and lasers and bugs and stuff so I went to lanshops and played with him. Slowly but surely, I developed an interest for the game as the competitive side of me couldn't be held in much longer so I began practicing more and more. The more I practiced the more I found out about the game so that's how I started. How old were you when you first started playing SC2? Thomas 'BlysK' Kopankiewicz: Hmm when did sc2 come out? 2010... so .. 19-4=15 15 years old! I started in bronze though ^.~ had to fight my way up! How long did it take you to get to GM? Thomas 'BlysK' Kopankiewicz: I think a year? For SEA GM that was when it was still active. I paced my buddy Yekke at the time. It seemed like he was always a league ahead of me literally. When Masters was out, he was there, I was stuck in Diamond. When GM came out, he was there, i was stuck in Masters. But yea one day I broke through, don't remember exactly when. I did throw my hands up in the air but its not like I celebrate an anniversary for it every year. Have you been playing Protoss from the very start? And if so, what drew you to pick that race? Thomas 'BlysK' Kopankiewicz: I played Terran at first. Would just build tanks and BCs, that's it (in practice league that worked well). Then I don't know why I transitioned to Protoss, and no it wasn't imba back then so shut up. But honestly, I liked spells. I'm a bit of an entertainer, I always try my best to be creative and entertaining in the matches I play instead of just focusing on winning. So storms, forcefields and clutch individual unit micro moves fit well into my playstyle. Its okay, I wasn't going to bag you out for it. It is always interesting to know why people gravitate towards the race of their choice. You have been fairly successful in the Singaporean scene since StarCraft 2's inception. What has been your proudest moment so far? The one defining moment which you can take from your career should it end today? That's a beautiful answer! Of course, passion for the game is always important and we see it everyday from everyone who plays it. Its extremely exciting to see players come from outside the ANZ region for an ACL for the first time. You are one of them. How did you make the decision to make this your first ACL event ever? Thomas 'BlysK' Kopankiewicz: Initially I was planning to participate in the Open bracket for IEM SZ [Shenzhen] on my expense as I have some relatives who live there so accommodation is covered, and it's cheaper. However qualifying for WCS is much more important for me so it was really hard to decide which one to go to. This might sound cheesy, but I prayed to God to ask (angel). And a few days before Challenger League, I got picked up by a team saying they would happily subsidise the cost of my flight there if need be. So woohoo prayer answered, and I knew where I should head to then. Also its still cool to finally get to meet the whole Australian community players and fans. Also first time in Australia, escaping Singapore's hellish heat is always nice. You did not qualify for the Group Stage yet, which means that you will be playing in the Open Bracket first up. Who do you think are your main rivals in the Open Bracket, and why? Honestly, I don't think I have any rivals. I'm just focusing on 1st prize, doesn't really matter who plays against me. Are you practicing strategies for specific people? You can't deny that both Iaguz and KingkOng are formidable opponents who most people think have the greatest shots at winning. Thomas 'BlysK' Kopankiewicz: Verse Iaguz, not really. Just standard PvT to see who's the better player will do. Verse KingkOng, maybe, but I don't tend to prepare specific builds for people in these sorts of format unless it's a Proleague/BO3 showmatch. So I just have the more refined builds vs casual builds. Vs top contenders I'll whip out my refined builds, vs those who I think are not much of a threat I will throw out random builds. How much practice are you able to put in from now until ACL Sydney? Will it be your sole focus or will you have school/work/other to do as well? Thomas 'BlysK' Kopankiewicz: It's unfortunately exam period. So I have a lot of projects to focus on. But I'll put in as much practice as I can, God multiplies my time. If I am focused in practice and can improve and refine my skills fast, I will do fine. Are there any specific things you do in your practice to help you make the most of your time? Thomas 'BlysK' Kopankiewicz: Ya focus on small specific details. For example for x no. of games I'll just focus on not getting supply blocked and getting my build order smooth regardless of loss or win. Then in other situations I focus on creativity, so I'll spend a few games trying different builds or different transitions for a build. It's much more effective than practicing blindly and saying "Hey I need to reach GM" or "I need more points to define my skill". I have to thank Grubby for these tips though. That's fascinating! How close are you and Grubby? Do you find him to be a sort of mentor-figure? Thomas 'BlysK' Kopankiewicz: You know we don't want to really define our relationship... It's a special thing HAHAHA. 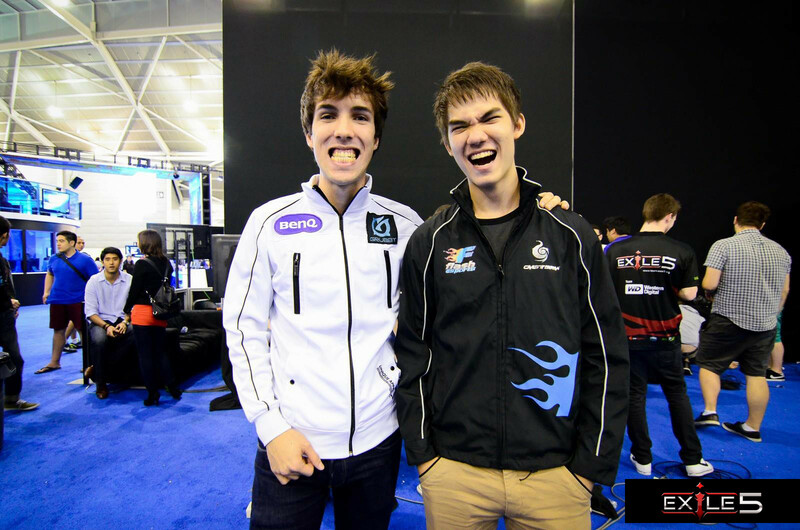 Our characters are really similar after we met in IEM Singapore, that's all. We chat once in a while on Skype. I look up to him more like a bigger brother though. I have just the right photo for this. So, on to the next topic. Have you ever been to Australia? Thomas 'BlysK' Kopankiewicz: Have you not been listening to my answers? I kid. No I have not. First time there, much excite. However I heard it's very costly there so... I'm probably going to want to head over to KingkOng's and ask him to cook for me as much as possible xDD Hyung Go wop ta! Hahaa you do realise KingkOng does not live in Sydney? Okay, I better go let Sam know! Thomas 'BlysK' Kopankiewicz: I'll let kingkong know through kaokao talk before you do HAHAHA I think he needs to hear it from me first. Sydney can be expensive, but it can also be inexpensive depending on where you go. Thomas 'BlysK' Kopankiewicz: Oh really? I guess I'll have the mates show me around then. What are your current impressions of Australia and Sydney, other than how expensive it is? Thomas 'BlysK' Kopankiewicz: Hmm what else? I don't know much about Australia so I don't have many impressions. Just that the coastline's beautiful, like the Opera House area etc. So i wanna go there and take pics. I hope you have a few spare days to do that. You should definitely check out the Sydney Opera House area, Darling Harbour, the Rocks, etc. So everyone is starting to come up with their own hashtag cheer, for example #cutforhut. I have no idea what that means other than it rhymes. If you had your own cheer, what would it be? I think #KissBlysk is perfect! We shall forever use this hashtag. Thomas 'BlysK' Kopankiewicz: Hahaha "Just won my first match today, time to come and #KissBlysk" can imagine my tweets already. It's settled then! I hope to see you do well at ACL Sydney. It is unfortunate that I cannot be there to meet you in person again. Are there any final words you would like to say to your fans and possibly your upcoming secret team? Thomas 'BlysK' Kopankiewicz: Yea! Don't worry I'm pretty sure we'll meet soon! For any fans I have, tweet me more haha. For fans, friends and everyone who's been supporting me I just want to thank you all so much for encouraging me and for helping me out so much. Without you all, I wouldn't be here today. My upcoming team I just want to thank the manager so much for picking me up. I feel really honored that someone can see me as talented and skilled amongst other possibly better players. Also a shout out to God for being in my life. Finally Dot and x5 for giving me this interview, much loves! Hope PiG does well in Dreamhack, I love that swine. Last edited by x5_dot; Wed, 16th-Jul-2014 at 7:48 PM. thanks for featuring the Singaporeans dot!